In 2012, a group of local residents who shared a passion for music, came together to discuss ways of creating a summer-only chamber orchestra as a way to reach out and teach music to the young people throughout Southern Wisconsin. 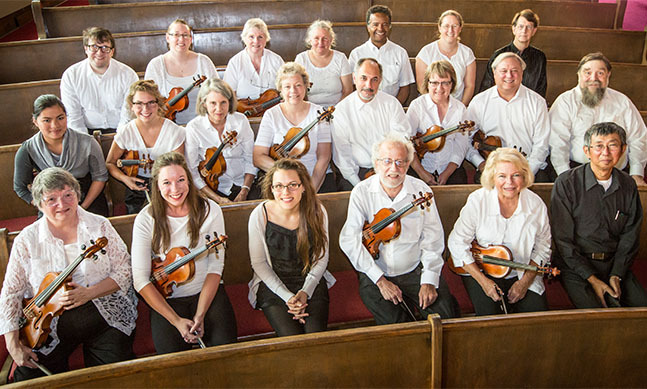 Every summer, TCCO plays eight concerts, mostly in the Beloit area, as well as nearby cities such as Edgerton, Delavan and Janesville. Each concert averages between 100 and 150 people. “We’ve grown tremendously,” says Roy. “There might have been seven people at our first concert. Since then, we’ve done a better job spreading the word. We recently played before 350 people in Janesville.” TCCO plays selections from Brahms, Bach, and Beethoven to John Williams and Vaughn Williams, as well as favorite Broadway and show tunes. The musicians are from the southern Wisconsin area and most are full-time teachers, or, have their own private studios and students. Many of them play for other groups such as the Beloit/Janesville Symphony, Rock Prairie Chamber Orchestra and Milwaukee Symphonia. Students who participate in the mini summer camp come from all across the area including Beloit, Monroe, Janesville and Fort Atkinson. For four days, students learn the fundamentals of playing string instruments such as violin, viola, cello and bass. Students are placed in beginner, intermediate and advanced classes. And the future looks bright for the Turtle Creek Chamber Orchestra . Roy says plans include expanding the four-day summer camp to four weeks, and possibly creating an international music festival that would draw music lovers from around the world to Beloit.